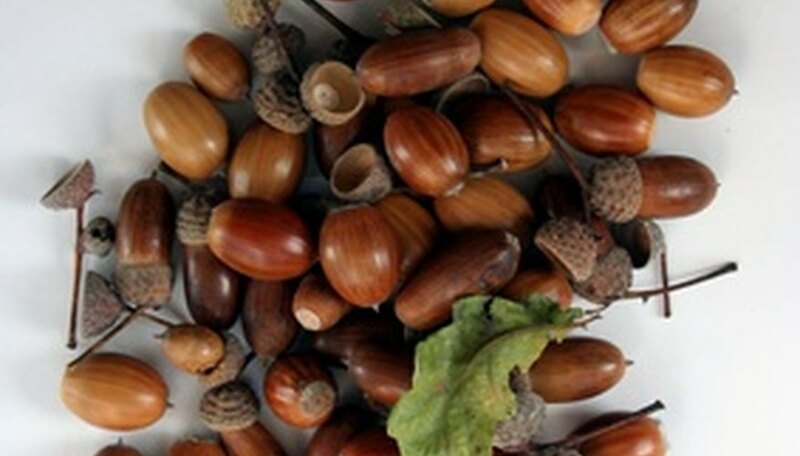 Starting oak trees from acorns does not require a green thumb. Choose acorns directly from the ground; do not pick them off of trees. Acorns on the ground are more mature and dried out. Acorns that are plump and that have easily removable caps are ideal. The best time to gather acorns is between September and November, depending on your location. Fill a bucket with water. Place your acorns in the water and let them soak overnight. Remove and discard any floating acorns. The nuts that sink will be the healthiest, and they are generally free of pests. Remove the acorns from the bucket and spread them out in a single layer on newspaper. Let them air-dry for one hour. Drying the nuts lessens their risk of developing mold. Place the dry acorns inside a large freezer bag. Remove as much air from the freezer bag as possible, and then seal the bag. Place the bag in a refrigerator for two months. This process will imitate a winter season and will increase the chances of successful germination when the acorns are planted. Choose pots that are at least 6 inches deep and have drainage holes. The pot depth is important, as your acorns will produce taproots. The drainage holes allow the water to stay moist but not saturated, decreasing the risk of root rot. Fill your pots with potting soil. The soil lines should be 2 inches from the top of the pots. Dig a small hole approximately 2 inches deep in the soil of each pot, and place the acorns in the holes. Situate the acorns so they are on their sides. Cover the acorns with soil. Only plant one acorn per pot. Water the pots until it flows out of the drainage holes. Place your pots in an area where they will receive 14 to 16 hours of sunlight. Water the pots every three to four days. Do not add fertilizer or other additives to the pots. Oak tree seedlings are very fragile, and applying fertilizer or other products to the growing soil can kill them. Plan to transfer your oak tree seedlings to a sunny location after the threat of frost has passed in your area. It is best to plant the seedlings when the first leaves open and before the root system extensively develops. Dig planting holes that are twice the depth and width of each sapling's root ball. Place the saplings into their holes so that their root crowns are level with the soil’s surface. Backfill the holes with soil, and tamp the soil down firmly with the flat edge of a hoe or your foot. Water liberally. Avoid fertilizing oak trees until they are at least a year old. They will obtain all the nutrients they need directly from the soil.